For too long Lent has been thought of as a season of self-sacrifice and discipline that sounds to many Christians like a list of spiritual chores. Lenten disciplines become the spiritual equivalent of New Year’s resolutions to lose weight, be healthier, or practice better money management. These promises are easily made and often quickly broken, leaving us feeling like we do not measure up to what we should be. In his letter to the Philippians, the apostle Paul joyfully turns to spiritual practices that draw him closer to God amid persecution and imprisonment. These practices keep Paul connected to a sense of God’s power and presence. 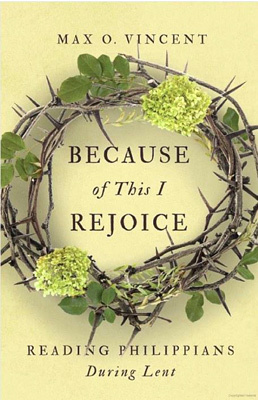 Joy flows from Paul and becomes a vital part of his relationship with the Philippians. Because of This I Rejoice is a 6-week study of Philippians that explores what Paul teaches about joyfully practicing spiritual disciplines. The intent of these disciplines is to help us focus less on ourselves and more on God. This Lenten study invites us to engage in the same spiritual practices as a way to grow closer to God and allow joy to flow through our lives. Book co-pay is $5.00. Please read the introduction and Week 1 for our first meeting.